There are only a handful of things in the world that can appeal to millions of people. Apple’s iPhone is certainly one of them. Last year, someone in Japan queued up to buy a new iPhone seven months ahead of its release. This year, while we haven’t heard any tale bestowing similar enthusiasm, but we’ve got a robot doing the standing job as its rightful owner takes care of her work and chores. Apple unveiled the iPhone 6s and the 6s Plus at a media event on September 9. The new iPhone models come with a handful of new features including 3D display, more powerful processor, and significant camera improvements. Both the new iPhone models go on sale in some regions including the United States, and United Kingdom from Friday. More than 10 million pre-orders were placed during the launch weekend, but there are many who prefer to stand in queue outside the store to be among the first ones to get the new iPhone on launch day. Many eager buyers have been standing in queue for more than a week now. Many have camped outside one of San Francisco’s Apple Store, whereas some are sleeping on the streets in front of the same store. But some are too lazy, or busy to do that. Which certainly is the case with Lucy Kelly, a Sydney-resident who has outsourced all the leg work to a robot, which is named after her. It comes with an iPad that allows Kelly to talk to anyone who is around the robot, as reported by Mashable. 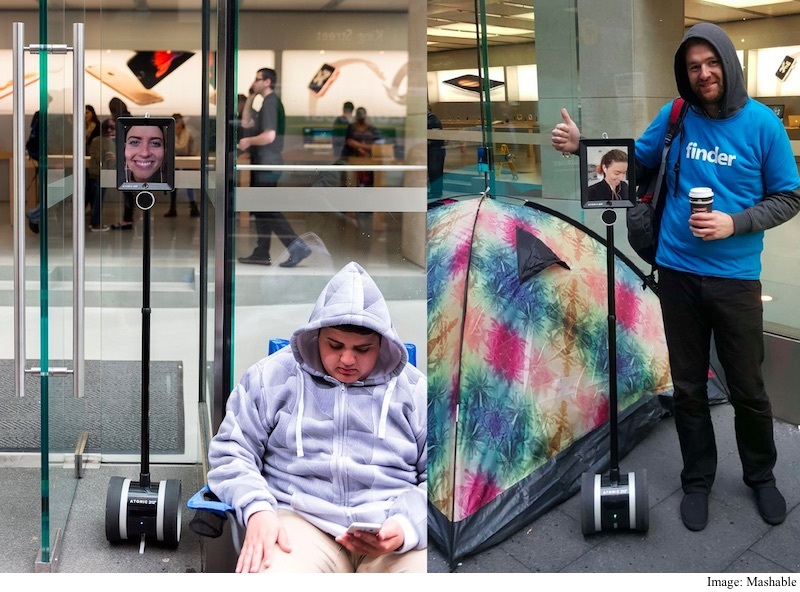 This is by far the smartest trick anyone has pulled in an iPhone queue. Lucy isn’t one of its kind. In fact, there are five more robots just like it, made by media agency Atomic 212. Rest of the robots, however, are busy completing other assignments. As you may have realised the queue for new iPhone models have become the playground for promotion and marketing. Several app developers stand in line to promote their apps, and similarly, accessory makers do the same to sell their products.